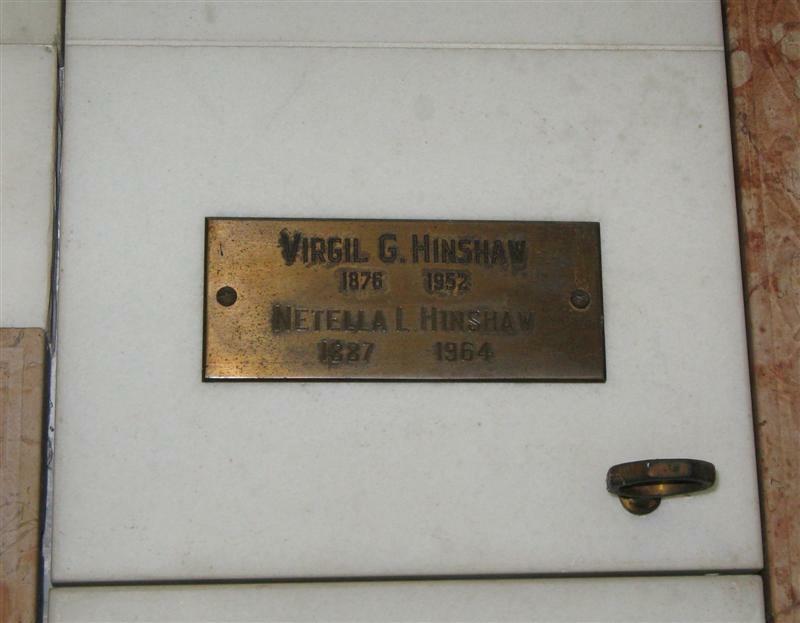 Hinshaw, Virgil G., head-of-household, age 44, born in Iowa; parents born in Iowa; owned home; attorney, "probition". Hinshaw, Eva, wife, age 35, born in Illinois; father born in Illinois; mother born in Germany. Hinshaw, Harold, son, age 7, born in Oregon; father born in Iowa; mother born in Illinois; attended school. Hinshaw, Randall, son, age 4 years 9 months, born in Illinois; father born in Iowa; mother born in Illinois. Hinshaw, Robert, son, age 1 year 8 months, born in Illinois; father born in Iowa; mother born in Illinois. Hinshaw, Virgil Jr., son, age 2 months, born in Illinois; father born in Iowa; mother born in Illinois. Dedert, Catherine, servant, age 16, born in Bohemia; parents born in Bohemia; immigrated in 1909; private family servant. Eva died Jan 28 19231,10,13,14 [Jan 30 192315], Hinsdale Sanitarium, Hinsdale, Cook County, Illinois1,10,13,14. Chicago, Jan. 30 -- Mrs. Eva Hinshaw, wife of Virgil G. Hinshaw, formerly chairman of the Prohibition Party national committee, was dead at a sanitarium today. The husband and four sons survive. Funeral services will be held tomorrow afternoon at the Hinshaw residence in Lagrange, Ill.
Hinshaw, Virgil G., head-of-household, age 54, born in Iowa; parents born in Iowa; first married at age 35; owned home ($6000 value); radio in home; occupation: International Secretary, International Reform Federation; not a veteran. Hinshaw, Nattella L., wife, age 42, born in Kansas; father born in Kansas; mother born in Indiana; first married at age 37. Hinshaw, Harold R., son, age 17, born in Oregon; father born in Iowa; mother born in Kansas; attended school. Hinshaw, Randall W., son, age 14, born in Illinois; father born in Iowa; mother born in Kansas; attended school. Hinshaw, Robert P., son, age 11, born in Illinois; father born in Iowa; mother born in Kansas; attended school. Hinshaw, Virgil G. Jr., son, age 10, born in Illinois; father born in Iowa; mother born in Kansas; attended school. Hinshaw, Harvey L., son, age 4 years 10 months, born in California; father born in Iowa; mother born in Kansas. Hinshaw, Paul M., son, age 2 years 10 months, born in California; father born in Iowa; mother born in Kansas. Hinshaw, Virgil G, 935 N. Oakland av; party: Prohibition; occupation: real estate. Hinshaw, Mrs. Nettella Loy, 935 N. Oakland av; party: Republican; occupation: housewife. Hinshaw, Randall W, 935 N. Oakland av; party: declined to state; occupation: student. Hinshaw, Harold R, 935 N. Oakland av; party: Republican; occupation: musician. Hinshaw, V. G., head-of-household, age 64, born in Iowa; completed 4 years of college; on Apr 1 1935 was living in the same place/city; rented home ($40/month rent); occupation: broker, real estate co.; worked 51 weeks in 1939; $1900 wages in 1939, plus other income. Hinshaw, Nettella, wife, age 52, born in Kansas; completed 4 years of college; on Apr 1 1935 was living in the same place/city. Hinshaw, Robert, son, age 21, born in Illinois; completed 3 years of college; on Apr 1 1935 was living in the same place/city; attended school. Hinshaw, Harvey, son, age 14, born in California; completed 2 years of high school; on Apr 1 1935 was living in the same place/city; attended school. Hinshaw, Paul, son, age 12, born in California; completed 7th grade; on Apr 1 1935 was living in the same place/city; attended school. Hinshaw, Virgil G., son, age 20, born in Illinois; completed 4 years of college; on Apr 1 1935 was living in the same place/city; attended school. Hinshaw, Randall, son, age 24, born in Illinois; completed 4 years of college; on Apr 1 1935 was living in the same place/city; attended school. Hinshaw, Randall W, 935 N. Oakland av; party: Democratic; occupation: student. Hinshaw, Robert P, 935 N. Oakland av; party: Democratic; occupation: student. Hinshaw, Virgil Jr, 935 N. Oakland av; party: Democratic; occupation: student. 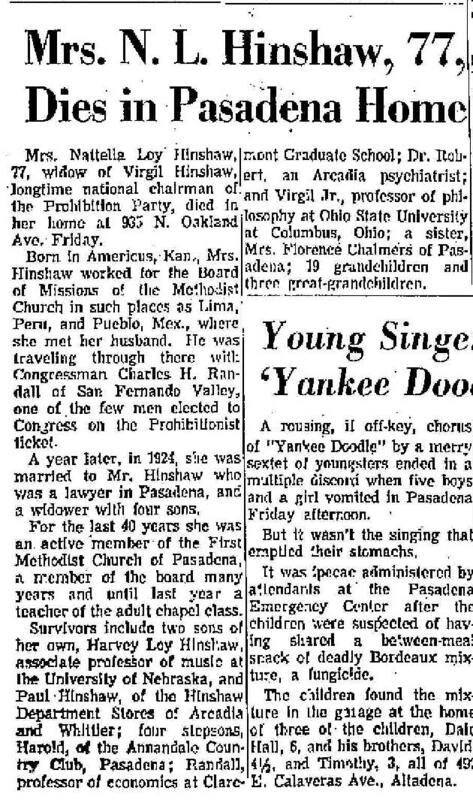 Netella's obituary was published in the "Pasadena Star-News" (Pasadena, California) on Saturday, August 22, 1964, and in the "Independent Star-News" (Pasadena, California) on Sunday, August 23, 1964:21,27 (see scans below). 1920 census, La Grange village, Lyons Township, Cook County, Illinois; roll T625-360, ED 105, page 16A, line #41, dwelling #259, family #300. 1930 census, Pasadena, Los Angeles County, California; roll T626-168, ED 1215, page 7B, line #62, dwelling #213, family #227. 1940 census, Pasadena, Los Angeles County, California; roll T627-240, ED 19-449, page 12A, line #5, household #356. "The Contemporary Authors", Volume 15, page 206. "Who's Who in America", Vol. 20, 1938; page 1220. 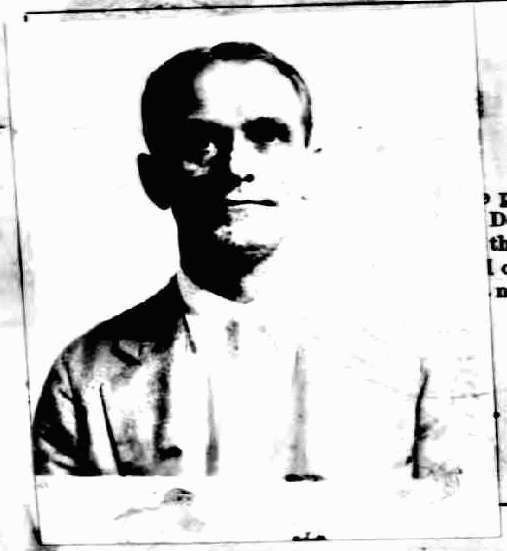 "The Decatur Review", Jan 30 1923; http://www.ancestry.com. "Star-News" (Pasadena, California), Mar 29 1965; http://www.ancestry.com. Obituary of Netella Loy Hinshaw; "Independent Star-News", Aug 23 1964; http://www.ancestry.com. Contribution from Thomas V. Hinshaw citing: Harvey Hinshaw. Harvey Hinshaw, confirmed by a wedding invitation. Obituary of Netella Loy Hinshaw; "Pasadena Star-News", Aug 22 1964; http://www.ancestry.com. Contribution from Thomas V. Hinshaw. "Fort Wayne Journal-Gazette", Jul 1 1916; http://www.ancestry.com.